The quickest way of getting the best repaired in our yard also, to keep your ship in longer life and action. 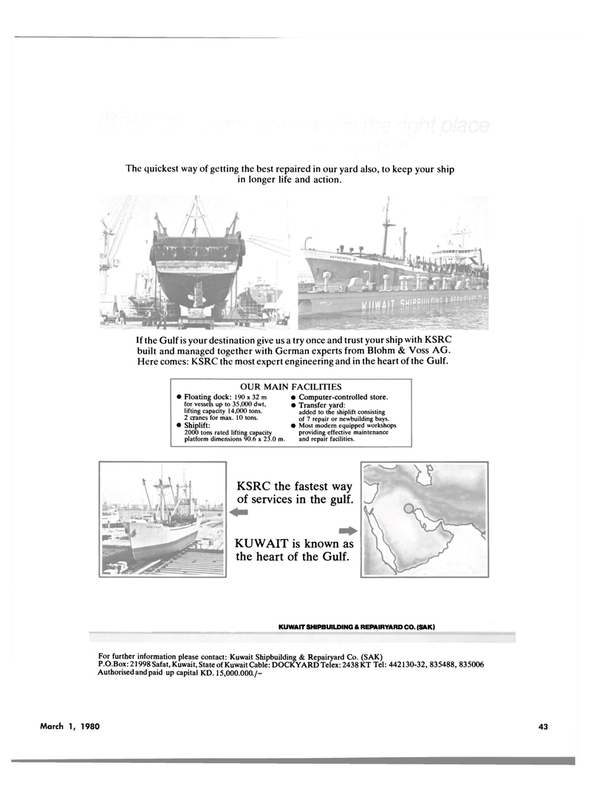 If the Gulf is your destination give us a try once and trust your ship with KSRC built and managed together with German experts from Blohm & Voss AG. Here comes: KSRC the most expert engineering and in the heart of the Gulf. OUR MAIN FACILITIES • Floating dock: 190 x 32 m for vessels up to 35,000 dwt, lifting capacity 14,000 tons. 2 cranes for max. 10 tons. • Shiplift: 2000 tons rated lifting capacity platform dimensions 90.6 x 23.0 m. • Computer-controlled store. • Transfer yard: added to the shiplift consisting of 7 repair or newbuilding bays. • Most modern equipped workshops providing effective maintenance and repair facilities. KSRC the fastest way of services in the gulf. KUWAIT is known as the heart of the Gulf.